Dr. John Stanley Ross is Director of Bands and Associate Professor of Music at Appalachian State University where he conducts the Appalachian Wind Ensemble, the Appalachian Concert Band, frequently guest conducts the Appalachian Symphonic Band, teaches courses in wind literature and band techniques, and guides all aspects of the ASU BANDS program. The Appalachian Wind Ensemble was invited to perform at the Annual North Carolina Music Educators Association Conference in Winston-Salem in November, 2007. This performance featured the World Premiere of River Songs of the South by William Harbinson, and the North Carolina Premiere of Fildfire by Elaine Ross. From 2003-2006, Dr. Ross was Director of Bands and Orchestras and Assistant Professor of Music at the University of Minnesota-Morris where he conducted the University Concert Band, Symphonic Wind Ensemble, Symphony Orchestra, String Orchestra, and Chamber Winds and taught courses in conducting, woodwind techniques, fundamentals of music, introduction to music, and applied clarinet. In 2005, the UMM Bands enjoyed a successful tour to Hawaii where they performed on Oahu and Kauai in collaboration with the Royal Hawaiian Band and the Kauai Community College Wind Symphony. During his residence in Minnesota, Dr. Ross was also the music director and conductor of the Prairie Winds, an adult concert band located in Willmar, Minnesota, and the conductor of the First Lutheran Church Senior Choir in Morris, Minnesota. Dr. Ross serves as President of the Board of Directors of the New York City based WEAVE Soundpainting Orchestra, a professional interdisciplinary ensemble that features improvisation with musicians, dancers, visual artists, and actors. John Ross has commissioned and arranged several works for winds and has conducted twenty-four world premieres. His performances have won the praise and admiration of composers such as Samuel Adler, David Gillingham, William Harbinson, and David Maslanka, among others. Recent and upcoming guest conducting, clinic, and speaking engagements include serving as keynote speaker for the 2007 Indiana CMENC Conference, Ft. Wayne, Indiana; the 2008 Minnesota Music Educators Association Annual Conference, Minneapolis, Minnesota; East Tennessee State University Wind Ensemble and Concert Band, Johnson City, Tennessee; Indiana-Purdue University Wind Ensemble, Ft. Wayne, Indiana; Science Hill High School Band Clinic, Johnson City, Tennessee; Carroll All-County Honor Band, Baltimore, Maryland; Indiana-Purdue University Band Festival, Fort Wayne, Indiana; the Sterling Municipal Band, Sterling, Illinois; the Litchfield High School Band, Litchfield, Minnesota; the Southern Methodist University Wind Ensemble, Dallas, Texas; the MBDA Minnesota 9-10 All-State Band, Wayzata, Minnesota; the Suburban East Music Festival, Saint Paul, Minnesota; the 42nd Annual All-City Band Festival, Detroit Lakes, Minnesota; the Central Lakes Honor Band, Central Lakes, Minnesota; the Minnewaska High School Wind Symphony, Glenwood, Minnesota; the Yellow Medicine East Bands, Granite Falls, Minnesota; the Sauk Rapids-Rice High School Bands, Sauk Rapids, Minnesota; the Kauai Community College Wind Symphony, Kauai, Hawaii; the Medalist Concert Band, Minneapolis, Minnesota; the 34th Infantry Band, Rosemount, Minnesota, along with numerous other conducting and clinic engagements with universities and public schools throughout the United States. Dr. Ross has performed clarinet with several ensembles including the University of Michigan Symphony Band, the Michigan State University Wind Symphony, the Traverse Symphony Orchestra, the Battle Creek Symphony, Quintessence Wind Quintet, and the Lawton Philharmonic and continues to perform as a recitalist. In 2005, Dr. Ross was inducted into the Phi Beta Mu International School Bandmaster Fraternity, and was honored with awards from Who's Who Among America's Teachers, and Who's Who In America. In 2004, Dr. Ross was inducted into the International Who's Who for Professionals. In 2003, he received the Minnesota Band Director's Association Award. On six occasions, Dr. Ross was honored with the Who's Who Among America's Teachers Award. In 1998, Dr. Ross was recognized as being a distinguished teacher in the arts by the National Foundation for Advancement in the Arts. In 1996, he was presented with the prestigious Citation of Excellence from the National Band Association. John Ross has guest conducted throughout the United States and in Romania, China, Hawaii, and South Korea. 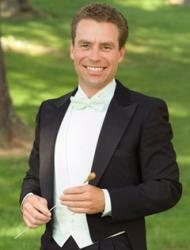 He is active as a guest conductor, clinician, and adjudicator throughout the United States and abroad. He appeared as guest conductor of the Banatul Philharmonic Orchestra and Chorus in Romania in December of 1998 where he conducted two sold-out performances of Carmina Burana by Carl Orff which achieved critical acclaim. During the 2002-2003 season, Dr. Ross was Director of Bands and Assistant Professor of Music at Cameron University in Lawton, Oklahoma where he conducted the University Concert Band, supervised student and first year teachers, and taught courses in chamber music, conducting, applied clarinet, secondary instrumental methods, woodwind techniques, and music appreciation. Also during this time, he served as Director of Music at First Presbyterian Church in Lawton, Oklahoma. From 1998-2003, he was the conductor and music director of the Grand Rapids Symphonic Band and Wind Ensemble in Michigan. In 2002, he completed his Doctor of Musical Arts degree in Wind Conducting at Michigan State University where he instructed the graduate wind conducting seminar, taught private lessons in conducting and clarinet, supervised student teachers, and conducted the University Concert Band. At Michigan State University, he was also a frequent guest conductor with the University Symphony Band, Wind Symphony, and Chamber Winds. During the 2001-2002 season, John Stanley Ross was a visiting assistant professor of music at The University of Michigan-Flint where he conducted the University Wind Symphony and taught courses in conducting, chamber music, and performance practice. From 1992-2000, he was the music director and conductor of the Interlochen Arts Academy Band and Wind Ensemble and instructor of conducting and music theory at Interlochen Center for the Arts. Under his direction, the Interlochen Arts Academy Band and Wind Ensemble performed to critical acclaim in many venues on tours including Hill Auditorium in Ann Arbor, Michigan as part of the 48th Annual Midwestern Conference on Vocal and Instrumental Music in 1993, and at the 50th Annual Mid-West International Band and Orchestra Clinic in Chicago in 1996. Numerous performances of the Academy Band and Wind Ensemble under the direction of Dr. Ross have been heard both on Interlochen Public Radio and on National Public Radio as part of their Performance Today series. The Academy Band performed four world premieres under the direction of John Ross during his tenure at Interlochen. At the Interlochen Arts Camp, he has guest conducted the National High School Concert Orchestra, High School Symphonic Band, High School Concert Band, and the Intermediate Band and was the instructor of the Advanced Conducting Class. From 1998-2002, John Stanley Ross was the conductor and music director of the Asbury United Methodist Chancel Choir. In 1996, he served as Music Director and Conductor of the Central Michigan University Symphonic Wind Ensemble as a sabbatical replacement. In 1995, Mr. Ross was the Music Director and Conductor of the Central Michigan University Symphony Band. Mr. Ross is the former Assistant Conductor of the University of Michigan Youth Band and the former Assistant Conductor and Instructor of Woodwinds for the Michigan Lion's All-State Band. From 1989-1991, he was the music director and conductor of the St. Charles United Methodist Chancel Choir. From 1988-1991, John Stanley Ross was Director of Music in St. Charles, Michigan where he received the Outstanding Faculty Achievement Award for excellence in teaching. In St. Charles, Dr. Ross taught fifth through twelfth grade instrumental and vocal music courses. Under his direction, the St. Charles Department of Music tripled in size and performed many successful concerts. At Michigan State University, Dr. Ross studied with Professors John L. Whitwell, John T. Madden, and Dr. Wesley J. Broadnax. In 1992, he earned his Master of Music degree in Wind Ensemble and Band Conducting from the University of Michigan where he studied conducting with Professors H. Robert Reynolds, Gary Lewis, Donald Schleicher, Jerry Blackstone, Gustav Meier and Dennis Glocke. In 1988, Dr. Ross received the Bachelor of Music Education Degree from Olivet College where he studied conducting with Dr. James Lambrecht and Dr. Charles Sykes. John Ross has completed further course study at Central Michigan University and Duquesne University and has studied with John E. Williamson, Dr. Robert Cameron, Elizabeth A. H. Green, and Larry Rachleff. John Stanley Ross is a member of the World Association for Symphonic Bands and Ensembles, the College Band Directors National Association, the National Band Association, Music Educators National Conference, North Carolina Music Educators Association, Minnesota Music Educators Association, Minnesota Band Directors Association, Minnesota State High School League, Oklahoma Music Educators Association, Michigan School Band and Orchestra Association, Phi Mu Alpha Sinfonia, Phi Beta Mu, and is an honorary member of Kappa Kappa Psi National Band Fraternity.